When you click the Post your self-grown food button (found on the top right of any page) a form will load. 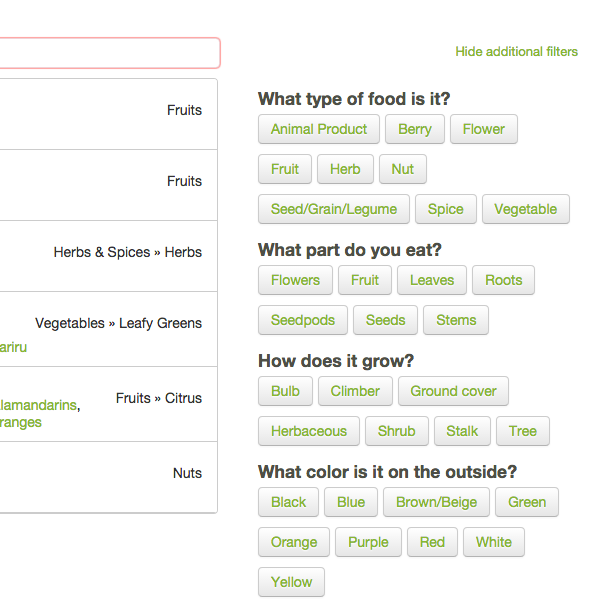 Filling in each field and submitting will list your produce on RipeNear.Me. We've created some helpful hints for each field on the form below. The first question you’re asked when adding your produce is “Is it on your property?”. Select yes or no and move to the next field (allow the new page to load if needed). As you type a food item here, options will drop down from the list. You can either use your mouse to select an item, or finish typing what you want to add in plural form. The field box will turn from red to green when a valid item has been entered. Some foods are known by different common names in various places around the world. Where more than one common name exists you'll see them displayed in green. You can either select the main heading, or click on another common name to use that instead. 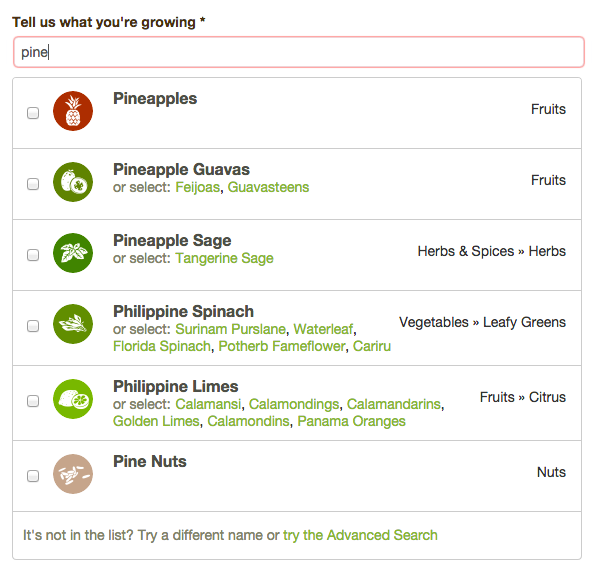 For example, when typing "pine" you’ll see Pineapple Guavas in the list. You can select Pineapple Guavas, or the alternative names "feijoas" or "guavasteens" by clicking the respective words. It's important to note that the word order of your text will change the results. For example if you type "Guavas Pineapple" no results will appear, whereas "Pineapple Guavas" will return a result. If you have trouble finding what you want, you can expose additional filters to help narrow down the list by clicking “show additional filters” on the right hand side of the field. Select from any of the filters presented there to filter the dropdown list. Note that the text you have entered into the field will also affect the filter, so you can edit or remove text in the field as needed. Enter any relevant information about your produce. This could include whether it’s grown in a pot or in the ground; the compost or fertiliser you use; if it’s organic; or if it’s a particular variety. When listing your produce you can determine whether to sell it or give away. This can be changed at any time. To set a price, enter a figure in the price field and change the unit of measurement as required. To list your produce as free simply leave the price field blank. Do some research. See what price that food is selling for at the supermarket. As individual growers, your food shouldn’t cost anywhere near as much to produce as it costs the supermarkets because you have no transport costs and are the primary growers of the food. So if lemons are selling for $1 each at the supermarket, you could probably sell them for half that amount, or even less if your tree’s teeming with lemons! You might also want to look at whether anyone on the site is growing that type of food in your area. If they are, see what price they have it set for and think about lowering your price to compete with them. After all, anyone who’s looking for that type of food in your area will see both of them, so they’re likely to go for the cheaper option. When you edit the location of your listings there are several ways to use the map pin widget. First is to enter an address in the text field and press enter on your keyboard. This will use Google Maps to find the address and drop your pin on the map. You can also left click and hold anywhere on the map to drag the map left and right, up and down. You can use the +/- symbols to the left of the text field to zoom in and out, or the scroll wheel on your mouse (when you cursor is positioned over the map). Also, you can hold down left click on the pin itself, then drag it to anywhere on the map and let go to position it exactly where you would like. You don’t even need to enter anything into the text field. Instead, you can simply left click anywhere on the map and the pin drop wherever your cursor is. Not sure you want to give away your address? We suggest you drop the pin for your produce at the next major road or intersection if privacy is a concern for you. Try to keep it as close to the actual location as possible; otherwise users nearby won't be able to find your food. When listing produce you have the option to upload a picture of the food you are selling. You can do this when you are first posting it or can do it later by selecting the food and clicking "Edit produce". Under "Add a new file" click the "Browse" button and select a photo of the food from your computer. 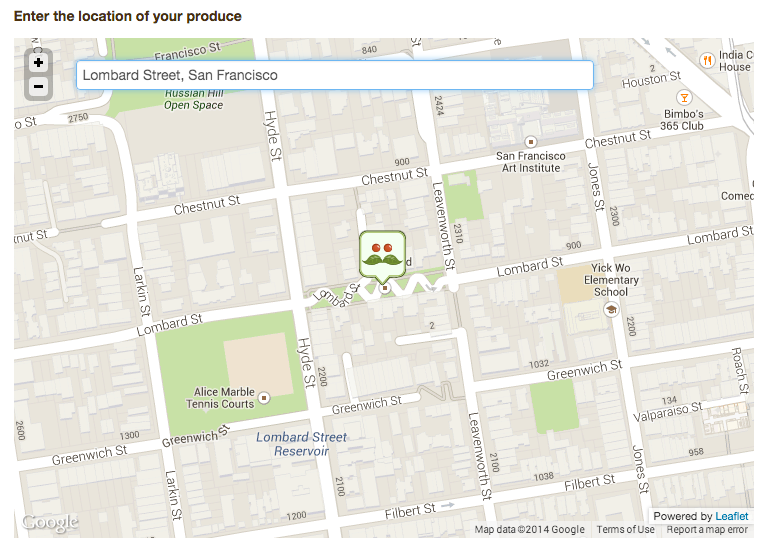 Once you’ve done this, simply click "Upload" and a picture of your produce will appear alongside it.